As the weather gets colder, I am always reminded of warm recipes that have been forgotten over the Summer months. This week I began to think about my recipe for tomato bisque and when Eric asked me to make it a few days ago I knew it was time to bring that recipe back into the rotation. I’m not a fan of regular tomato soup, I never have been but give me a bowl of tomato bisque and you may find my licking it clean so as not to waste any precious drop. I love dunking bread or sandwiches into tomato bisque and the way it really sticks to the sandwich, your spoon and even your stomach; it really warms you up and makes you feel content. The recipe is straight forward but you will need a blender, food processor or immersion blender to make it. I used to use a blender to smooth everything together but last year Eric bought me an immersion blender for Christmas and that has revolutionized my bisque process. Now I have many fewer dishes to wash and the soup is creamy and delicious. If you make any sort of bisque often, I recommend the immersion blender, plus you can find them easily for $50 or less. To start the bisque, you need some good fat; melt butter in a large stock pot and then fry up the diced bacon so that it releases all the fat. Scoop the bacon out with a slotted spoon once it begins to brown. Now you’ve got a flavorful base for the soup. Throw the onions, garlic, carrot and celery into the pot and saute until everything is soft, 5-8 minutes. Add in the flour and mix well. Fry the flowered mixture for another 3 minutes. Simmer the whole pot on low heat for 30 minutes. Take the soup off the heat and pull out the herb bouquet, throw it away. If you’re using an immersion blender, pour the soup into a mixing bowl to avoid damaging the stock pot. If you’re using a regular blender, you can ladle the soup in batches into the blender and blend until smooth. I used the immersion blender and blended the whole thing until it was smooth, then I poured it back into the pot and put it over medium heat. Once boiling, whisk in the heavy cream, salt and pepper to taste. The soup will thicken after a minute or two. Serve with a slice of crusty bread or my favorite, grilled ham and cheese sandwich. Whisk the heavy cream and salt into the soup and season with pepper to taste. Divide among warm soup bowls and serve immediately. As the weather turns to Summer, we begin to eat more burgers. 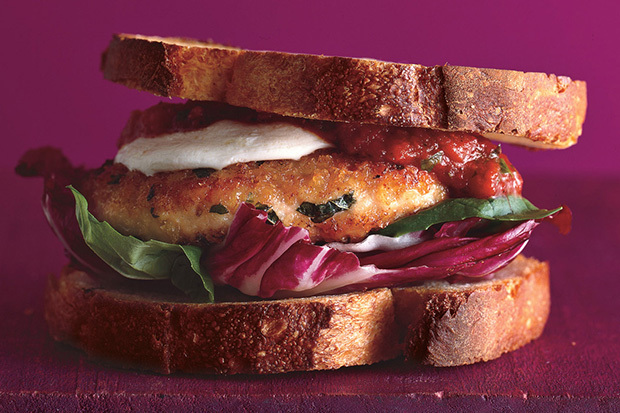 Last week I shared my turkey burger recipe with you and today I’d like to share another favorite burger, the Chicken Parmesan Burger. I like this recipe because its fast, 30 minutes or less on a weeknight, its cheap requiring only a few ingredients (most of which are in my pantry already and ground chicken is incredible inexpensive), its not your typical burger, OH and its delicious. 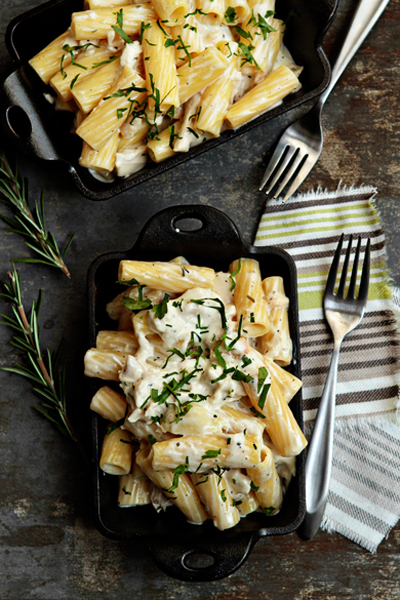 I found this recipe in Bon Apetit last year (I know I sound like a broken record with Bon Apetit) and stole the image above from Epicurious.com. I found a vendor selling beautiful basil at market last week and immediately wanted to make these burgers. I put a large basil leaf on each burger and they’re delicious. To begin this recipe, first put some sauce and chopped up basil into a small saucepan over low heat on the stove. Put 1 1/2 tablespoons of the sauce from the pan into a bowl with the ground chicken and onion, salt and pepper. I like to use a fork to stir mine up because I hate the feeling of raw chicken on my hands but feel free to use your hands to mix everything up well. Now the recipe calls for you to make your own breadcrumbs with french bread by toasting the bread, cutting it into cubes and putting it in the food processor with parmesan. Feel free to do that, but I prefer to use store bought breadcrumbs and mix them with the parmesan on a plate. It will taste exactly the same and save you time, plus you’ll have less dishes to wash. Mix 1/2 cup of bread crumbs and 1/2 cup of grated parmesan cheese together. Form the ground chicken mixture into patties (I usually end up with 4) about an inch or so thick and coat them in the breadcrumb mixture. Heat up oil in a large non-stick skillet over medium heat and cook the burgers for about 4 minutes on one side. Flip the burgers over, place a slice of mozarella cheese on top and cover with a lid. Cook for about 4 more minutes. **Warning** Your kichen will get smoky so make sure your fan is on and a window is cracked. Once the burger is cooked through and the cheese has melted, put your burger on a bun or slice of french bread. I have eaten it both ways but today I didn’t have french bread so I just used a burger roll. Top the burger with a whole basil leaf and some of the warmed marinara sauce on the stove. I also like to put a dollop of sauce on my plate to dip into.